NEW YORK – March 24, 2016 — Starting today at 2:00pm EDT, the State Higher Education Executive Officers association (SHEEO), the Association of American Colleges and Universities (AAC&U), and Taskstream are collaboratively hosting the first in a series of six free webinars on student learning assessment in higher education. 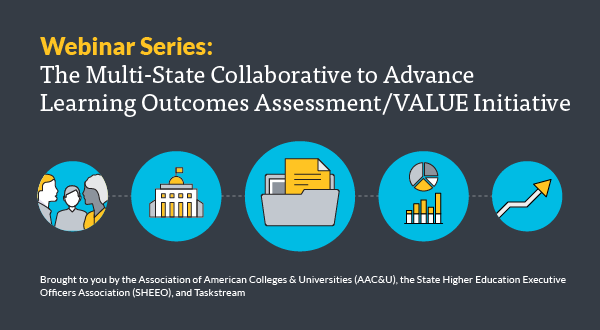 The series, scheduled to run through the end of June, will share best practices and key learnings highlighting the work of the current phase of the AAC&U VALUE Initiative and the Multi-State Collaborative to Advance Learning Outcomes Assessment (MSC). During today’s webinar, Carnahan and Terrel Rhodes, Vice President at AAC&U, will present, “Assessment for Improvement: the Multi-State Collaborative to Advance Learning Outcomes Assessment/VALUE Initiative.” The webinar will provide an inside look into the background, process, resources, and initial findings – including assessment scores and results – from the pilot year of the MSC. As the two primary project leaders, Carnahan and Rhodes will also discuss reflections and implications for the next phase of this growing initiative. Over the next three months, the webinar series will cover additional topics important to state educational officers, institutional leaders, assessment professionals, faculty, and policy makers. Topics will include: faculty engagement; identifying assignments and collecting student artifacts; and the analysis and use of assessment data for accreditation and to inform changes to improve student learning. Registration for today’s webinar is available on Taskstream’s website: https://www.watermarkinsights.com/event/assessment-for-improvement-mscwebinar1/. The next webinar in the series, “Engaging Faculty in Meaningful Assessment: Leveraging the National VALUE Project to Make Local Strides” is scheduled for Tuesday, April 5 at 2:00pm EDT and will feature speakers from the University of Kentucky, the Community College of Rhode Island, and Hamline University (MN).